According to a report from Korea, Mercedes signed an agreement with LG Display to supply its 12.3" FHD flexible pOLED displays for a future E-Class automobile. The dashboard of the upcoming car will use two such displays, side by side - one showing the instrument cluster and the other information such as navigation. Yonhap news says that LGD aims to become the world's largest automotive display provider. LG Display wants to gain a 30% market share and reach $2 billion in yearly sales from this market. LGD already supply LCDs to this market, but the Korean maker expects flexible OLEDs to "fast replace the currently available glass-made LCD panels". LGD announced its entry to the flexible OLED automotive market back in July 2014 - and indeed back then the company already said it signed OLED supply contracts with several car makers in Germany - including Daimler-Benz. 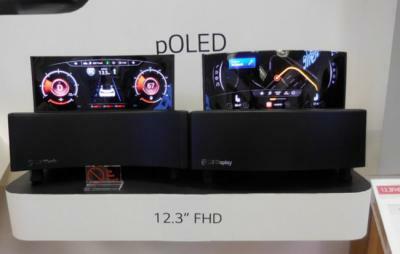 In January 2016 LGD first unveil its 12.3" Full-HD flexible OLED panels for the automotive market. The automobile market is starting to become an important market for OLED makers - for both OLED displays and OLED lighting. Want to learn more about the OLED Automotive market? Check out the OLED-Info Automotive OLEDs Market Report, which was recently updated.